Daewoo Express or Sammi Daewoo Express is an inter-city common carrier of passengers by bus serving over 30 destinations in Pakistan and is headquartered in Lahore. It is operated by a Korean company, Sammi. Today, it is the most popular inter-city bus service in Pakistan. 33 cities on 43 destinations with over 20054542 buses. Sammi Daewoo City Bus was the first environmental and technological revolution in the urban transport sector within Pakistan. The buses were introduced with more advanced and powerful engines with TECHO Monitoring Systems in 1999. Moreover provision of Air Conditioning, announcement system and stopping signals were introduced. 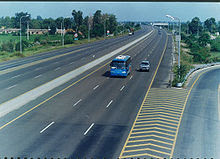 Since 1998, the city bus service has been operating four routes are being operated within the city covering all the localities while two Sub-Urban Routes are being operated for Gujranwala and Sheikhupura. is a main operations of the company. The company provides long distance time efficient bus services to all major cities within Pakistan. With its Headquarters in Lahore the company is operating its service from 31 cities in Pakistan covering more than 40 destinations extending almost to the entire Punjab, Sindh and NWFP. The provides direct competition against airlines as well as the rail network. There are also shuttle/drop off service that run off the main express buses to allow passengers hassle-free travel to their neighborhood. Recently, Daewoo expanded its service to Okara cantt connecting it with 9 cities. Daewoo Express's cargo service are set up adjacent to all terminals and function 24 hours a day, providing safe and quick dispatch and delivery of cargo consignments. The cargo volume has over the years been increasing more rapidly than the expansions of the bus passenger operations.